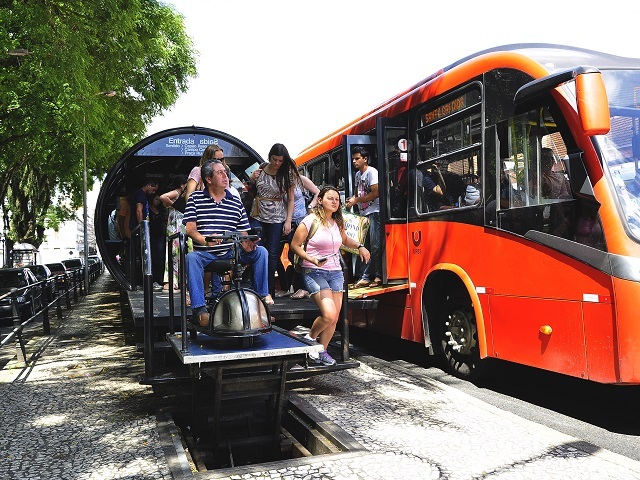 Europe learned that speed, reliability, and comfort are essential for successful public transport systems, and Brazil is taking note. Photo by EMBARQ Brasil. For those who live in or visit Brazil’s cities, it is not hard to see the effects of increasing motorization and car usage on our urban centers. Too many cities have become crippled by bottlenecks and stifling traffic congestion. Increased purchasing power together with government incentives has created the enabling factors that will grow Brazil’s motorization rate to 250 private vehicles per thousand inhabitants by 2020. Most major Brazilian cities already reached this rate in the early 2000s and are now approaching 350 vehicles per thousand inhabitants. In Brazil, many still believe that widening roads and building flyovers will one day solve our congestion woes. Our European friends have already proved in the last century that this is not the sustainable solution, as an increase in road supply only induces a growth in demand for private cars. Instead, what did help European cities control traffic was the creation of integrated transport systems under the management of city transport authorities. By promoting the use of non-motorized transport and restricting the use of private cars, they began a growing movement of human-centered, livable cities. For instance, the early 1980s saw a resurgence of streetcars, which were virtually extinct in many European cities for half a century. Europe’s new generation of streetcars allowed for greater speeds, reliability, and modern features typical of subway systems – like level boarding – that attracted people to mass transport. In the 1990s, European cities began to incorporate bus system overhauls as a part of their transport improvements. Many cities also undertook a series of advertising campaigns to change the image of systems previously perceived as being irregular, slow, and uncomfortable. Among the improvements to physical stations were the deployment of dedicated tracks, real-time information at stations, and prioritization at intersections. In addition, many cities implemented the BHLS (buses with high levels of service) concept, which employ central operation control and information systems, providing integration between buses and other modes of transport as well as adding comforts like ergonomic seats, power outlets, cable TV, and free Wi-Fi. In many cases, BHLS doubled the ridership of previous bus services, even attracting car users. Brazil has many challenges ahead to stop the advance of the automobile. The first steps are being taken, as many cities have implemented dedicated bus lanes that free buses from the congestion faced by private cars. The lessons from Europe are clear, and now we must work on multiple fronts to achieve high-quality, sustainable urban mobility. This article originally appeared in Portuguese in the second edition of the Revista NTU Urbano. Translation by Rachel Jaffe and Ryan Schleeter.